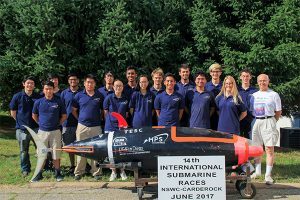 The human powered submarine team pose in front of their submarine. UC San Diego undergraduates design and build a submarine in hopes of racing it at the International Submarine Races against other universities. San Diego, April 26, 2018 – A group of roughly 20 undergraduate students –bonded by bondo, fiberglass skin and their innate desire to build –are hoping to enter their human-powered submarine in the European International Submarine Races in the summer. The unveiling of their design will take place Thursday April 26 at 7 p.m. and will include a brief presentation describing the race and its guidelines. The team will also show off the new and improved design that they plan to compete with this summer. Industry professionals and researchers from the Scripps Institution of Oceanography and other UC San Diego entities will be in attendance to offer advice to and share their passion for engineering with these students. This isn’t the first time that UCSD has participated in the European International Submarine races. Back in 2000, UCSD broke the world record for the class One Person non propellor with a dolphin fin boat called “subsonic” going four mph. For this year’s race, the team chose to design and build a dolphin-fin submarine because it is an innovative challenge that requires an unconventional propulsion mechanism: a six-bar linkage optimized using a genetic algorithm. The team is also using biomimicry to inspire the design of their propulsion fin, specifically multi-material 3D printing to mimic the flexible trailing edge of a dolphin tail. The team’s first iteration of steering fins was made possible through a collaboration with the Qualcomm Institute’s DroneLab. Structural Engineering Professor Falko Kuester, the director of the DroneLab provided the students with use of the 3-D printers to create their submarine parts. For club-member Tobin Gutermuth, this project and the research required to complete it has given him a boost of confidence.